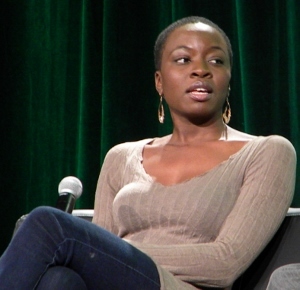 “Acting can be quite excruciating,” Danai Gurira confessed during her solo panel at Seattle’s Emerald City Comicon, March 3, 2013. The actress best known as aggressive walker-killer Michonne on AMC’s The Walking Dead was also featured in a panel along with Dead co-star Michael Rooker (Merle) the night before. Stripped of Michonne’s trademark dreadlocks, she looked a little different than the character she plays. 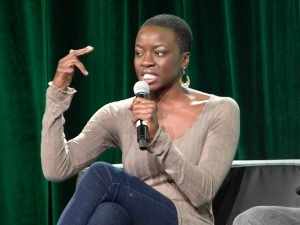 She was also notably more relaxed than Michonne as she spoke casually about her introduction to the world of zombies. 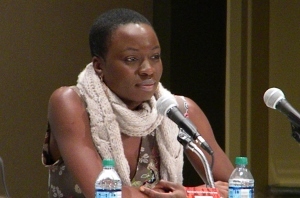 During the audience Q&A portion of the panel, Gurira deftly sidestepped a couple questions about the issue of race on The Walking Dead. Stepping up to the mic, one audience member—a self-described “teacher”—explained that she screens Dead for her sociology students as part of their coursework. She gleefully stereotyped her own students, claiming that “all” of her “white students” are frightened by Michonne. The so-called teacher went on to share that “all” of her students of color question why Michonne ever even cared about or listened to the “white girl” (Andrea, played by Laurie Holden). To her credit, Gurira had little comment on this teacher’s “lesson” (which honestly sounded more like simple-minded muckraking than productive teaching). Another young man said he cannot enjoy The Walking Dead as much as he once did after reading some criticisms of the show’s handling of African-American characters. 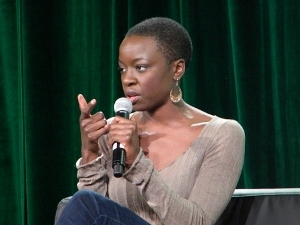 Again Gurira chose to remain neutral, saying, “Just get to episode 16 and then have that conversation,” calling such discourse, “pointless at this juncture.” Regarding allegations that the show has been too quick to dispose of African-American characters, Gurira said she takes it all “with a big grain of salt.” She also emphatically point out that Robert Kirkman (creator of The Walking Dead comic book upon which the show is based) did, in fact, create major characters that not of European descent. Gurira enthusiastically talked about being a founding member of the Children’s Performing Arts Workshop in Zimbabwe, where she grew up (she was born, incidentally, in Iowa). On wanting to become an actor early in life: “I had parents who—I won’t say they were massively supportive. They just weren’t intrusive.” Being the youngest child in the household (“I was the mistake baby”) helped her become more independent as she followed her own path. 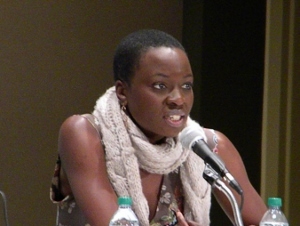 “I was just doing what I love,” Gurira said of her embrace of acting. Fans of The Walking Dead are all the better for it. Love this show and love Michonne’s character. She is so strong. I can’t wait to see how the final episodes this season play out. Wasn’t sure what to think when Michonne first appeared, but she has quickly become one of my fave characters. She is a tough B. A. and she makes me want to work on some swordplay. I haven’t read any of the comics so I’m interested to see what else we find out about her character. As per the panel discussion she took part in, sometimes there’s just no accounting for what some people will do to interact with a celebrity. It sounds like she handled it like a pro; very classy.